Traditional wings in Native’s honey hot sauce. 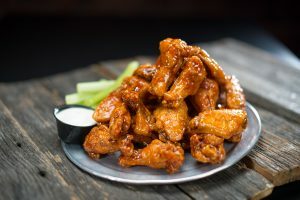 CHANDLER, AZ (3TV/CBS 5) – An Arizona-based restaurant chain is offering quite the deal for National Chicken Wing Day. Native Grill and Wings will feature 10-cent wings for the holiday on Sunday, July 29. That’s the price wings were back in 1979, when the chain was founded. As for the fine print, there is a maximum of 10 wings per person and only one sauce or dry rub per order. The deal is for dine-in only. Guests can choose from over 20 different sauces from Strawberry Hot to Ancho Chile lime, Asian Garlic to Honey Chipotle. “National Chicken Wing Day is not just any holiday – it’s our holiday that allows us (to) showcase Native’s roots and why we began in the first place,” Dan Chaon, CEO of Native Grill & Wings, said in a statement. What started in Chandler almost 40-years ago, Native now has more than 30 restaurants in Arizona, Texas, Illinois and South Dakota. The restaurant’s claim to fame is for introducing chicken wings to the Valley of the Sun. National Chicken Wing day started in 1977 with a proclamation from Buffalo Mayor Stan Makowski, according to the holiday’s website. People reportedly ate around 1.3 billion chicken wings just during the Super Bowl and an estimated 28 billion traditional bone-in chicken wings were eaten in 2016, according to the National Chicken Council.